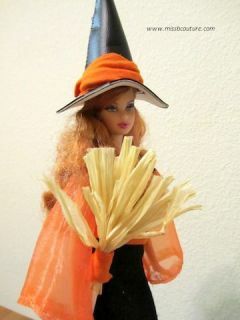 Here is the witch hat and broom to complete the Halloween witch outfit for your Barbie! It will not take you a long time for complete the Halloween costume. The hat is made with a thick faux leather. You can easily replace it by cardboard and recover it with black fabric. - Turn the top of the hat to make a cone for the hat. Then put a piece of tap and either stapple it or sew it. Make sure it fits the doll’s head. - Then cut the extra fabric to make the hat round on the base. It doesn’t have to be perfect, it’s a witch hat. I’ll put a little black marker on the stapples so they won’t show. 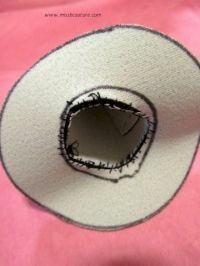 - Glue or staple the fabric on the hat. Then sew around it to make it solid. - Sew the tulle on the top the hat. - Put the decoration arround the hat. I glued sequins arround it. - Then cut the fabric in the middle. Don’t cut it perfectly, so you can sew it to the top and you can put it on the doll’s head. It won’t fall. 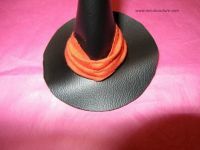 Then sew the orange piece of fabric (or ribbon) arround the hat. Take the stick and put a piece of sided tap on the top. Put the hay arround it. It doesn’t have to be perfect. Then tape gain arround the hay. You can use glue if the tap doesn’t stick enough. Sew a little piece of orange fabric arround it, sew it very tight so the hay won’t move. The Halloween witch hat and broom are ready! Your (kind) witch is ready to fly away !